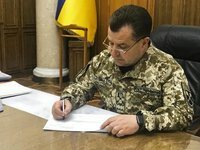 Ukrainian President Petro Poroshenko has accepted the tender of Minister of Defense, General of the Army of Ukraine Stepan Poltorak on resignation from military service and decided to continue his work as Minister. "Poltorak submitted the relevant tender. And I, frankly speaking, accepted this tender heavy-heartedly," Poroshenko said at the solemn events devoted to honoring of Ukrainian military servicemen in Kyiv on Saturday. The head of state reminded that in accordance with the requirements of the Law of Ukraine "On the National Security of Ukraine", from January 1, 2019, the post of Minister of Defense of Ukraine shall be occupied by a civilian. The president said that the law on the national security was agreed upon with our NATO partners, and that procedure was possible. "Therefore, my decision completely corresponds to the letter and spirit of the law," he added. "Appreciating the significant, crucial contribution of Stepan Poltorak to the revival of the Armed Forces of Ukraine and to the revival and establishment of the National Guard of Ukraine, I decided that he would continue the management of the defense ministry already in the status of a civilian minister," the president said. Poroshenko thanked the Minister for his military service to which Poltorak gave 35 years of his life. The defense minister said that he completed military service, but he did not finish serving to the Ukrainian people. Poltorak thanked Poroshenko for the creation of the new Ukrainian Armed Forces, which finally became the guarantor of our statehood and independence of Ukraine. "Thank you for returning trust, respect and pride to the service in the Armed Forces of Ukraine," he said. He also thanked all the soldiers, sergeants, officers, generals with whom he served. "Especially those with whom I served the last four years, because these were the most difficult years in the life of the state and my life," the minister said. The president handed over to Stepan Poltorak the Order of Bohdan Khmelnytsky of the first degree.